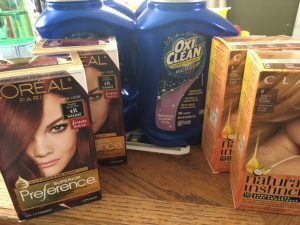 Used two of the $3.50 Natural Instincts coupons with the 2/$17 sale (post with links here), 2 Free Hair Color (scan for $9 automatically) and the $3 Oxi-Clean coupons from 5/20 S or here with the $3.99 sale. Used a $4 ebs and a $3 Beauty Club coupon, which brought my subtotal down to $2.96. Submitted to Ibotta (in the parking lot) for a $3 Clairol rebate which came immediately. Got back a $4 and a $5 ecb for the hair colors. These also earn towards the Buy 7 Get a Free Hair Color Coupon promotion.